Following on from the cars from the swinging ‘60s, here in no particular order are our top five picks from the 1970s. As before, they’re all reasonably practical and could have served as the one family car, while the choices were based as much on nostalgia as their investment potential. We’ll be following up with five more each from the 1980s, and if we’ve omitted any that were on your childhood wish list, or still are, then please let us know and tell us why. The 3.0 CSL story starts in 1965 with the 2000 C and CS, futuristically-styled two-door, 4-seater coupes. 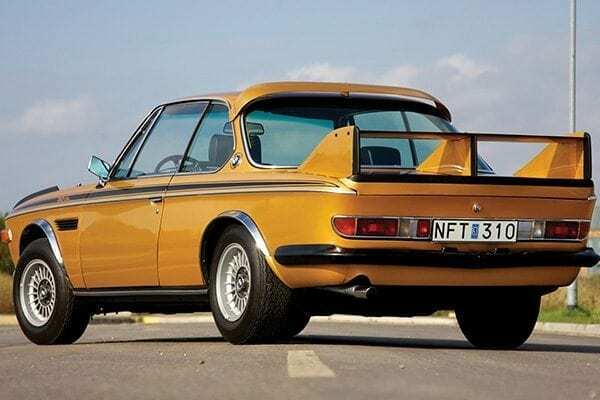 This was followed during the late ’60s and early ‘70s by the 2500, 2800 and 3.0 CS and CSi models – all beautifully proportioned, highly desirable coupes based on BMW’s E9 executive saloon which, with their sweet-sounding inline 6-cylinder engines, had 120mph+ potential. 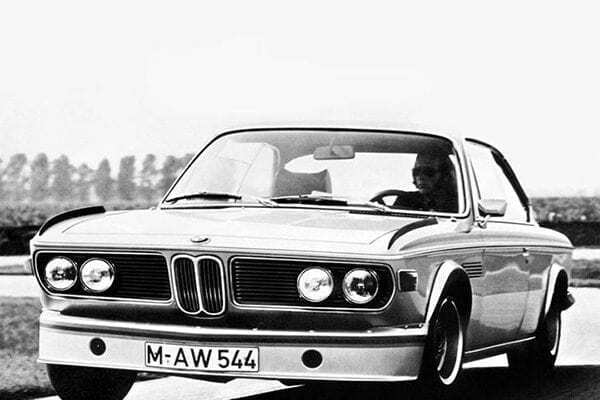 The first CSL version – Coupe Sports Lightweight – appeared in 1971. It was a stripped-out, bare-bones car built for European Touring Car Championship homologation – a series that CSLs went on to win no less than six times during the ‘70s. Originally with a twin-carburettor 180bhp 2,958cc motor, the CSL had thinner steel body panels (the bonnet, doors and boot lid being aluminium), plus a number of other weight-shedding measures including plexi-glass winding windows and reduced sound absorption and rust protection, thus saving 200kg. It also featured lowered, stiffer gas-shock suspension, a limited-slip diff and one-piece bucket seats, while chromed wheelarch extensions shrouded the 7-inch wide Alpina alloys. In August ’72 the engine was upped to 3,003cc with fuel injection, and power consequently rose to 206bhp. All of the 539 CSLs built thus far had been LHD, but in October ’72 the first UK-spec CSLs arrived. These were all equipped the ‘RHD City Package’ to tempt those wanting the car’s hard-core image with a 7.5 sec 0-60 time and a near 140mph max, but with a little extra comfort and refinement. This put some of the previously pared weight back on but the car still tipped the scales at a trim 1,270kg. Also for racing homologation but illegal on German public roads at the time, CSLs were supplied with the then outlandish but very effective aerodynamic ‘Batmobile’ fins and wings stored in the boot. A total of 1,095 CSLs were built, and 500 RHD versions came to the UK (of which it’s thought fewer than 250 survive), but at around £8,500, and this being some time before BMW acquired its lofty premium brand status, they weren’t an easy sell. A 3,153cc version was launched in 1973 with low-volume LHD production continuing for another couple of years. 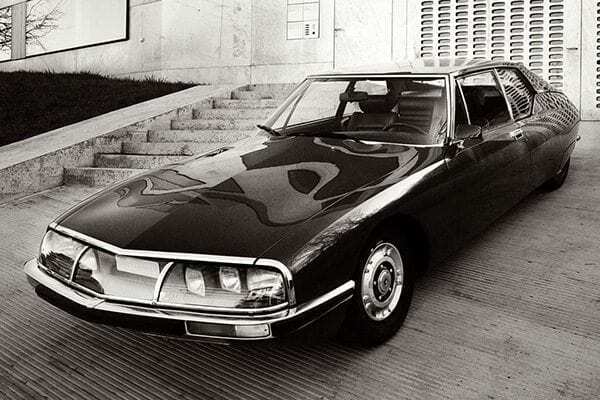 Having taken a controlling interest in Maserati in the late 1960s, Citroen was keen to showcase both firms’ talents by producing a true sporting Grand Tourer. 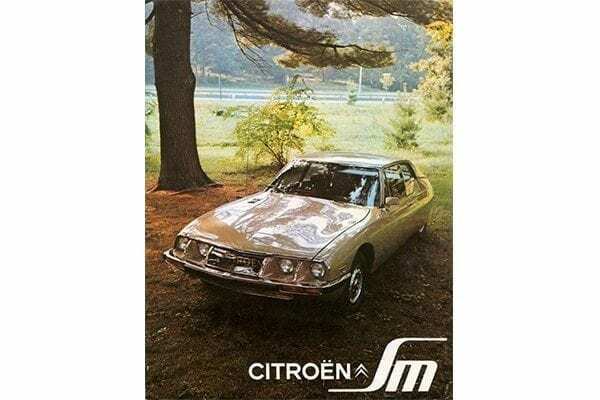 The result was the Citroen SM, launched at the 1970 Geneva show, and it was the first GT from a major French manufacturer for as long as anyone could remember. Under the bonnet sat a 4-cam, Maserati V6 with capacity reduced to 2,670cc to avoid a punitive French tax on engines over 2.8 litres. With 170bhp the SM could accelerate to 60 in 8.2 secs and, helped by its quirky but slippery shape – note the Kamm tail and faired-in headlamps – make it to 140mph or more. Like the DS saloon, the SM was front-wheel-drive and featured Citroen’s unique hydropneumatic self-levelling suspension and self-levelling headlamps that moved with the steering. Equipped with disc-brakes all round (inboard at the front) and ultra-quick, speed-variable power steering – both of which required some acclimatization – road testers of the day were unanimously impressed by the SM’s speed, comfort, stability and handling. Despite the early ‘70s oil crisis, a 180bhp 3-litre version followed in 1973 and a little under 13,000 SMs were built up to 1975, all left-hand-drive. Although there were some right-hand-drive conversions, persuading Dad to buy a LHD £6,700 SM – £400 more than a Porsche 911 – was close to impossible, so the capable but complex SM never became a common sight on British roads. Current equivalent: Is there one?! Launched in 1961, the Series 1 E-Type was an instant classic. It’s beautifully curvy aerodynamic shape, 265bhp 3.8-litre engine and near 150mph performance, all for a fraction of the price of an Aston Martin or Ferrari, ensured its iconic status. Available as a 2-seater roadster or hardtop coupe, the latter featured a capacious luggage compartment with a side-hinged hatchback, thus making it the ideal high-speed grand tourer. A similarly powerful but torquier 4.2-litre engine was introduced in late 1964, and the first 2+2 version was added in 1966. 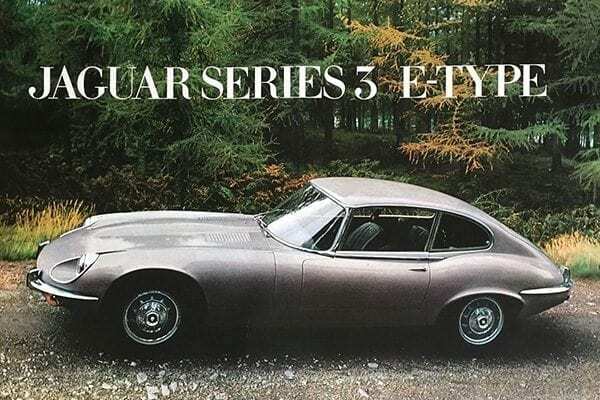 The Series 2 E-Type arrived in 1968, still with the 4.2 engine, while 1971 saw the introduction of the 5.3-litre V12-powered Series 3, although now available only as a roadster or 2+2 coupe, the 2-seat coupe having been dropped. With a 9-inch longer wheelbase, a more upright screen rake and a redesigned roofline to accommodate rear seat passengers (albeit small ones), no-one has ever argued that the 2+2 E-Type is prettier than its 2-seat coupe sibling. 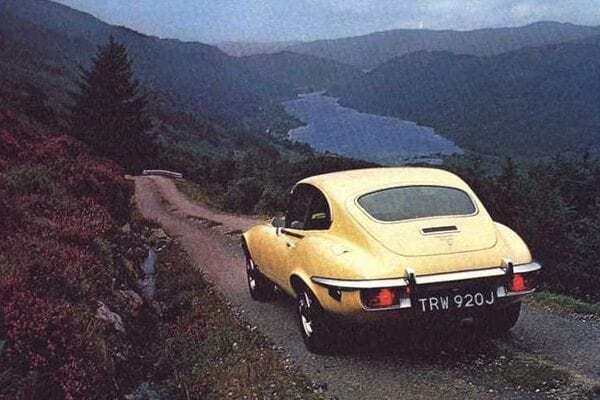 Enzo Ferrari famously described the E-Type as ‘the most beautiful car ever made’, but that was before the 2+2… However, in the eyes of a young 1970s petrolhead an E-Type was an E-Type and as such the 2+2 was still hugely desirable, and even more so when its specification taken into account. The earlier 4.2 engine had been emasculated by US emission controls, but the big new V12 brought performance back to early/mid ‘60s levels. Power was rated at 314bhp which meant 0-60 in under 7 secs with a 143mph top speed, thus putting it very much on a par with the fastest of its competitors. According to Bill Boddy’s review in Motor Sport (Jan ’72), “…the V12 Jaguar proved to be a very fine effortless high-speed touring car, which would accelerate effectively from 100 m.p.h. upwards”. Costing £3,387 in 1972, E-Type 2+2 production continued until 1973 with 16,239 having been built, 7,297 of those being V12 2+2s. Having purchased the hallowed Lagonda name back in 1948, Aston Martin’s first attempt to revive the marque came in 1961 with the 6-cyl Lagonda Rapide saloon, but only 64 were built over the ensuing three years. 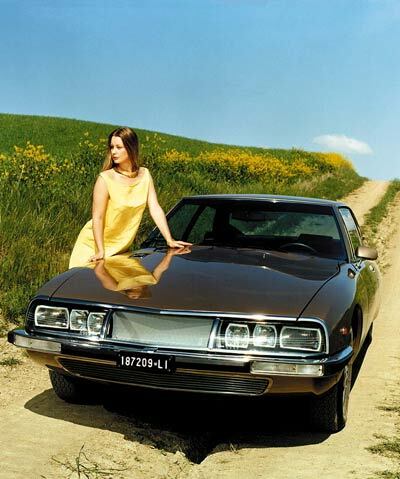 The second revival attempt was the Series 1 Lagonda V8 saloon – essentially a lengthened, 4-door version of the 2-door AM V8 coupe with a Lagonda grille, but demand for the £14,000, 160mph car was poor and a mere seven were built between 1974 and 1976. 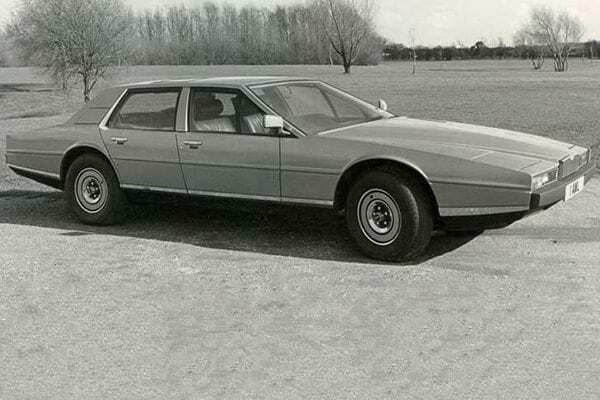 Despite this less-than-stellar success with 4-seaters, visitors to the 1976 Earls Court show were stunned by the Series 2 Lagonda V8. Featuring very edgy and futuristic wedge-shaped styling, along with pop-up headlamps, advanced LED instrumentation and touch-sensitive switches, this long and luxurious 4-door super-saloon was considered by many to be the motoring equivalent of Concorde. Under the Lagonda’s exceptionally long nose were familiar Aston Martin mechanicals – a 280bhp 5.3-litre DOHC V8 which allowed for 0-60 in 8.8 secs along with a 143mph top speed. Originally offered at £25,000 in 1977, by the end of the decade the price had almost doubled to just under £50,000, rendering it pricier than the 4-seater Ferrari 400 and Maserati Kyalami, and only slightly cheaper than a 2-door Rolls-Royce. 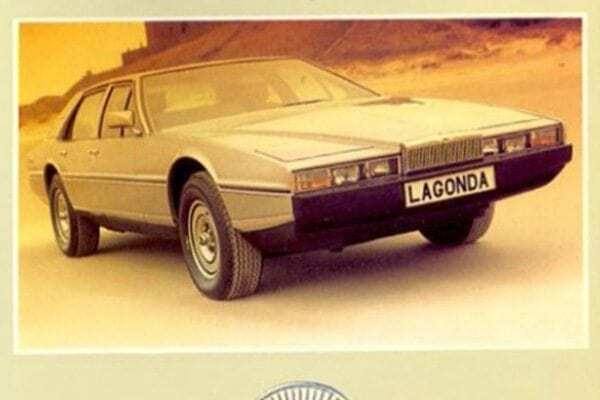 This, along with it being over 17ft long and 6ft wide with a somewhat cramped interior and an avaricious thirst for fuel, meant that the Lagonda didn’t appear at the top of most UK dad’s shopping lists. 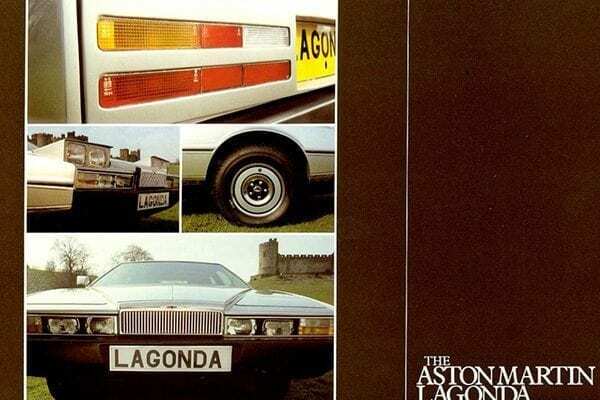 Luckily for Aston Martin, the Lagonda did prove reasonably popular with the company’s Middle Eastern clientele, and so including the later Series 3 and 4 versions, a total of 645 were produced up until 1989. 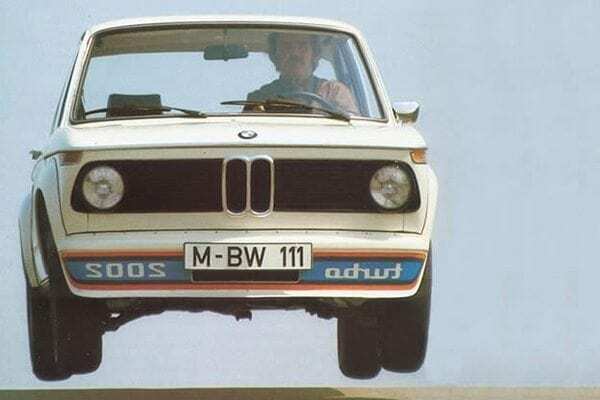 In the ten years from 1966, BMW built close on 140,000 2002s. The basic 2-litre 4-cylinder model made 100bhp, so it was a fairly nippy thing, but the twin-carb 2002ti version put out 120bhp, so was sportier still. 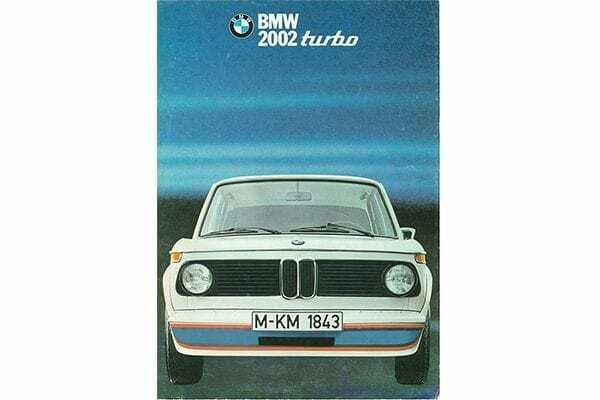 In 1972 the ti was replaced by the fuel-injected 130bhp tii, and, with an 8.2 sec 0-60 time and a 120mph top speed, the 2002tii was the first of the 02 series cars to be indelibly inked onto dads’ wish lists. But then, at the 1973 Frankfurt show, came Europe’s first turbocharged production car, the 2002 Turbo. Weighing in at 1,060kg, its 1,991cc tii-based engine had lowered compression and was force fed by a KKK turbocharger, the net result being 168bhp along with 0-62 in 6.9 secs and 131mph capability. To cope with this Porsche 911-rivalling performance, 2002 Turbos had a beefed-up driveshaft, a limited-slip diff, anti-roll bars front and rear, upgraded dampers with stiffer springing and 6-inch wide Mahle alloy wheels, along with ventilated discs and 4-piston calipers at the front. Other distinguishing features included a snow-plough front air dam, a bootlid spoiler and fat ‘bolt-on’ wheel arch extensions, all garnished with prominent BMW Motorsport stripes and Turbo decals. Inside there were rake-adjustable bucket seats, a three-spoke sports steering wheel, a red-faced instrument panel and, not least, a turbo boost gauge. All terrific stuff, but it was the turbo that proved the car’s undoing. Without a wastegate, intercooler or clever electronics, the turbo unit was primitive, and, following a period of lag it suddenly took effect at around 4,000rpm thus rendering the car something of a handful. Furthermore, returning 20mpg at a time when fuel costs were rocketing also diminished the Turbo’s appeal. Despite being the car every boy racer lusted after, the 2002 Turbo’s 1,672 production run lasted just 10 months and, priced at around £6,000 in the UK, all were LHD as the turbocharger was situated right where the steering column went in RHD 2002s. There’s no doubt that the 2002tii was the more rounded, better developed car, but despite its foibles the rare and charismatic Turbo remains the collectors’ choice. So, those are our picks from the 1970s, all with a degree of family practicality that we wished had been parked on our drives back in the day. There were others of course, such as the Mercedes 450SLC and Range Rover V8, plus the Jaguar XJ12 and Fiat 130 Coupes. More modest cars like the Ford Capri 2.8i, Reliant Scimitar GTE and Triumph Dolomite Sprint were also wish-list worthy, but our 1980s favourites now beckon, so stay tuned! We’re passionate about classic and performance cars at JBR Capital and we can quickly build a tailored finance package to suit your needs. So if you’re interested in acquiring the car you coveted in the 70s, whether through direct purchase or at auction, then please call one of our experts today on 020 3355 0035 – we would be happy to explore your finance options with you.